A few questions I keep getting asked and would love to share them with you. Myth: You can’t eat nutmeg when you have a tree nut allergy. Myth: You can’t eat allspice when you have a tree nut allergy. False – According to the Encyclopedia of Spice, allspice is a berry that smells like a combination of spices, especially cinnamon, cloves, ginger and nutmeg. Allspice belongs to the Myrtle family which also includes Cloves, Eucalyptus, Guava, Paprika and Pimento. Heat a large stock pot over a medium high heat, add olive oil and heat another minute. Season short ribs on all sides with Kosher salt. 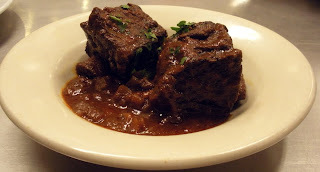 Brown short ribs on all sides in stock pot, remove from pan and set aside. Mix together thyme, parsley and pepper, set aside. Add additional oil if necessary and add onion to pot and cook until soft and translucent. Add ½ of spice mix. Add garlic, cook an additional minute. Add carrot and celery with 2nd ½ of spice mix. Once vegetables are soft, push to side and add tomato paste to pan. Make sure not to burn. Add wine to deglaze pan and reduce by ½. Place meat back in pan and cover with water. Place fresh thyme and bay leaves in a coffee filter (fold top to seal) and add to pot. Place pot in oven covered for 3 hours or until meat falls off the bone. Add additional water if needed and flip ribs about ½ way thru process. Make sure you store ribs in braising liquid to stay moist. BOKA Menu Finally Revealed & SWIRLZ Cupcakes bringing dessert! Take a look at this amazing, flavorfully inventive menu Chef Giuseppe Tentori has created especially for next week’s Safe & Sound Dinner – our last dinner for 2009 -- next Monday, November 2nd at Chicago hot-spot BOKA. Our Safe & Sound Dinners challenge top local chefs to create a special, one-night-only menu just for us, free of gluten and as many of “The Big 8” allergens as possible. It’s a fun and lively group dining experience, a great way to meet and share tips with allergenistas, and includes a fabulous gift bag filled with allergen-free swag….all for $50! Space is limited and requires advance reservations. Picholine olives - The Picholine is best known as a cocktail olive, though it is also used to make olive oil. Cream - a mixture of pureed onions to give quinoa a creamy consistency. White runner beans - Larger than limas, slightly irregular in shape, these beans are creamy and sweet for soups, salads or as a side dish. 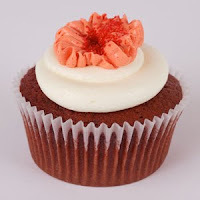 To top it all off, our friends from SWIRLZ are providing their deliciously decadent, allergen-free signature cupcakes. What a great way to wrap-our 2009 Safe & Sound Dinner series! I have had the flu for the past week and found myself watching way more than my share of TV with little appetite to speak of. As I started to feel better, I began craving something sweet. 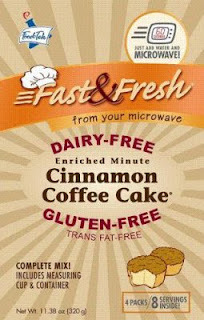 So I took a look at some of the product I had left over from our last Safe & Sound Dinner and happily found a sample of Fast & Fresh’s Minute Cinnamon Coffee Cake Mix, I hadn’t tried this flavor yet. It’s a really neat product, your kids could even make it on their own, it only requires water, mixing and a microwave, I also had some Cherrybrook Kitchen’s Vanilla Frosting. Now both products are good, especially when you have dietary restrictions, but the two together were just wonderful, I felt like I was eating a freshly baked cinnamon roll! Give it a try next time your sweet tooth kicks in, but beware allergenistas with egg allergies, this cake mix has egg in it! You can buy Fast &Fresh products online or at American Health Foods, in Oak Lawn. Cherrybrook Kitchen products are available online and at Whole Foods, some Jewels and local health food and allergen friendly stores. It has been so rainy and gray in Chicago, I thought we were due for something with a little kick! I used andouille flavored Chicken sausage if you don’t eat pork and the results were great. I had all the chefs at CHIC try this dish and they all loved it, hope you do too! 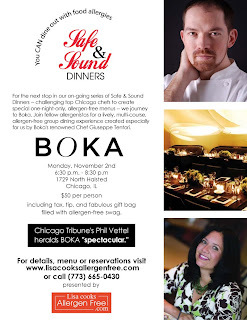 Tickets are going fast for our Safe & Sound Dinner at BOKA, reserve your spot by clicking here! Mix together thyme, oregano, salt, black pepper and cayenne pepper, set aside. Heat a large stock pot over moderate heat, add olive oil and heat another minute. Whisk in the rice flour and cook, whisking constantly, until it starts to brown, about 4 minutes. Reduce the heat to moderately low. Stir in the onion and cook until it starts to soften, add ½ of mixed spices. Add celery, bell pepper and remaining mixed spices, cook another few minutes. Add the okra, bay leaf, and tomatoes. Cover and cook for 5 minutes. Stir in the broth and the smoked sausage. Bring to a boil. Reduce the heat and simmer for 15 minutes. Add the chicken and cook about 5 more minutes until the chicken is. Remove the bay leaves. Meanwhile, cook rice according to package instructions. 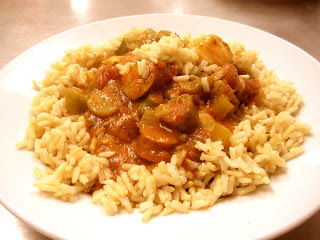 Serve gumbo over rice and enjoy! I have been working on my recipes in the test kitchen at the Cooking and Hospitality Institute with Chef Brian Karam. He has been a great help and resource in fine tuning my collection but this chicken recipe was a hit, no adjustment necessary! Usually I have leftovers to bring to my husband, but nothing was left, sorry Mark! Heat a large sauté pan over medium high heat for one minute. Sear chicken in pan over medium high heat until browned. Place chicken pieces in a shallow baking pan, skin side up. 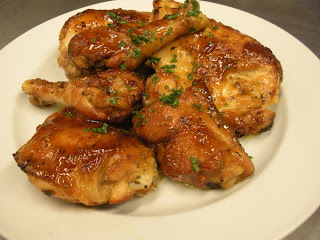 Combine extra-virgin olive oil, honey, mustard, Kosher salt and cayenne pepper and pour the mixture over the chicken. Bake for 1¼ hours, basting every 15 minutes with pan drippings, until the chicken is nicely browned and tender and the juices run clear (internal temperature 165°F). 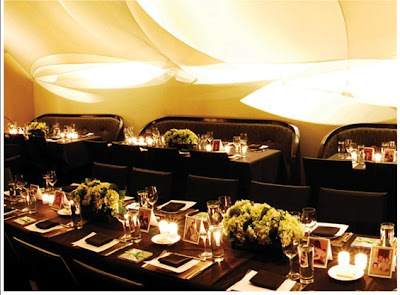 For our next Safe & Sound Dinner – the last scheduled for 2009 -- join me and fellow allergenistas as we journey to chic, red-hot Boka, which Chicago magazine calls “the hottest ticket in town,” and which remains a top pick on both the local and national dining scenes. 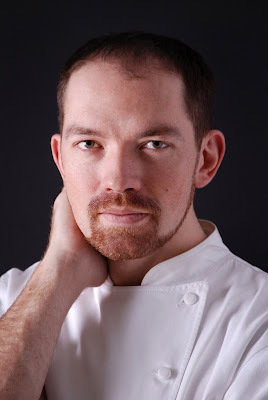 This time, I’ve thrown down a challenge to friend Giuseppe Tentori, Boka’s Corporate Chef, to create a complete, multi-course dinner free of gluten, as well as free of “The Big 8:” wheat, eggs, soy, dairy, fish, shellfish, peanuts and tree nuts. Giuseppe’s challenge will be unveiled at 6:30 p.m. Monday, November 2, during a lively group dining experience in the sleek, stylish setting of Boka, located at 1729 North Halsted, Chicago. Giuseppe Tentori has been named one of Food & Wine magazine’s Best New Chefs of 2008, famed New York magazine critic Gael Greene proclaims “Tentori’s food is marvelous,” and Chicago Tribune’s Phil Vettel heralds Boka “spectacular.” I’m excited and proud that Boka has risen to the challenge of joining us in bringing this type of fabulous, not-to-be-missed experience to Chicago’s allergen community. What a great way to end our 2009 Safe & Sound Dinner series! Tickets for our Safe & Sound Dinner at Boka are $50 per person, require advance reservations, and include a complete, multi-course dinner, as well as all tax and gratuity, along with a fantastic, filled-to-the-rim allergen-free goodie bag for each guest. 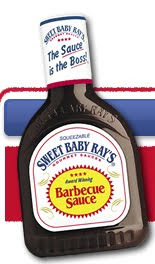 Regarding the “Baby Ray’s product. The natural Flavor comes for Worcester Shire Sauce. Modified food Starch is from Corn. Caramel coloring is from Sugar. I did some further research on Worcestershire sauce and some of the larger brands contained anchovies, so I wrote back to “Ray” to be sure and they responded immediately, what a relief, enjoy allergenistas! There are no Anchovies in the Worcester Shire Sauce. There is no fish, shell fish, Egg, Soy, Dairy, Wheat, peanut, or tree nut in the Sweet baby Rays. I have been working on recipes as part of my internship for the Cooking and Hospitality Institute and this recipe is perfect for cool Chicago fall nights. These ingredients are readily available this time of year, making this dish economical as well as tasty. Enjoy! 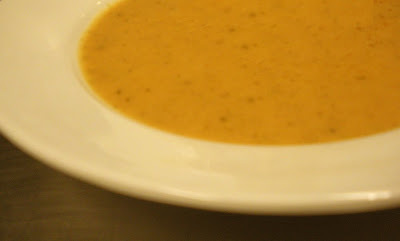 This soup has some kick to it, if you like less heat, reduce or eliminate the cayenne pepper. Oh, don’t forget to add the apple and croutons to the top of the soup like I did on the pic! Heat saute pan over medium high heat, add one tablespoon olive oil & heat another minute. Add bread cubes to oil and heat until crispy, split in ½ and set aside. Mix together salt, pepper, allspice, ginger, curry and cayenne pepper, set aside. In a large stock pot, add olive oil to heat. Add onion and cook until soft and translucent. At this point you will want to add about 1/3rd of the spice mix. Add carrots and parsnip, sprinkle with additional 1/3rd of spice mix, cook until soft, about 3 min. Add squash and 1/2 of bread, mix with final 1/3rd of spice mix and cook until soft. Push ingredients to side and deglaze pan with wine and cook until wine evaporates. Add stock and reduce heat to simmer for about 20 minutes. While soup is simmering, heat saute pan over medium heat, add canola oil, heat another minute & then add apples and brown sugar to carmelize. Remove apples from pan and cut into small pieces.Use blender to puree soup, serve in a bowl topped with carmelized apples and remaining bread crumbs.